June is the beginning of the rainy season and if you believe the the PAGASA’s announcements, summer is officially over and we could all look forward to our usual smattering of typhoons. Since it’s impossible to predict the probability of rain weeks in advance, I advise travelers to Sagada to keep looking at weather reports and forecasts. Buses to Sagada will still go regardless of what storm signal is raised as long as roads are still passable. Happy (and safe) travels, everyone! I was lucky enough to see Marlboro Country for the first time last August when I went on a trip with a few friends. Marlboro Country was named as such due to its very hilly terrain and the novelty of having wild horses in the valleys surrounding it. GMA 7’s Howie Severino even ran a story on the origin and fate that awaits these noble steeds. Marlboro Country is a thirty minute hike from a drop off point in Lamangan. It’s a fairly easy walk and you would be definitely enamored with the tall trees that line the marked path to a central clearing. You’ll know that you’re at the end of the trail when the entire panorama opens up and just surprises you with a full 360 view of the mountains, hills and terraces nearby. It’s almost like being at a mountain summit. It’s perfect for those who want to sit by the cliff and just reflect. It’s also a good place for photographers. 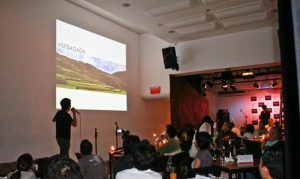 I was a presenter at the recently held Ignite Manila at Bonifacio High Street. Sixteen individuals shared sixteen impassioned talks on things that they really love. There were talks about music, sports, science, philosophy and even health concerns. I spoke seventh and you would expect; I professed my undying love for Sagada. The Ignite series is on going on six continents and over 60 cities this week! It was a very successful venture. Congratulations to all the speakers and of course, to RYAN TANI for this great event! Arsonists unite! Inquirer reported today that there was a lethal armed clash between communist rebels and government forces near baranggay Mainit. The baranggay is under the jurisdiction of the provincial capital of Mountain Province Bontoc despite being over an hour away by jeepney. There are only two trips daily in and out of the place. To give you an idea, Baranggay Mainit is still almost three hours away from Sagada by car. As a precaution though, officials have decided to make the Bomod-ok Falls in Baranggay Aguid off limits to visitors for now. Sagada is peaceful as ever and the authorities are definitely trying to get on top of the situation against the NPA.